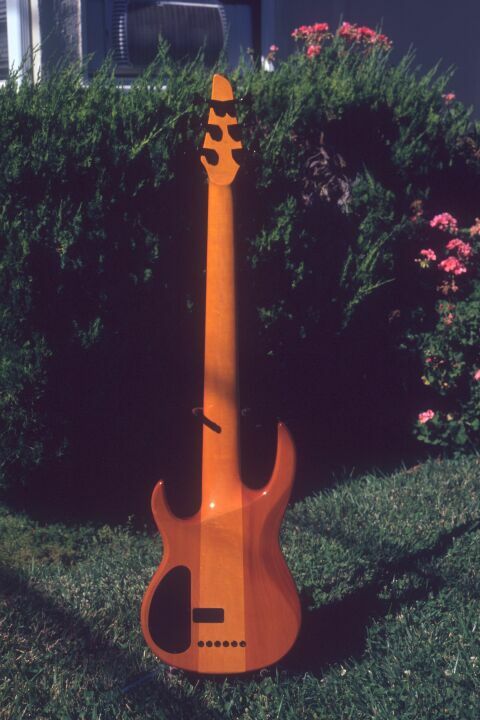 This jewel was picked up at Carvin's Covina, CA store on July 3, 2002. It had a ridiculously low price tag - so low that the salesman did a double-take and checked with his manager about the price! But it was legit, the bass having been a showroom queen that was priced to move, and move it did - into my bass closet! I'm not sure of the date of manufacture. 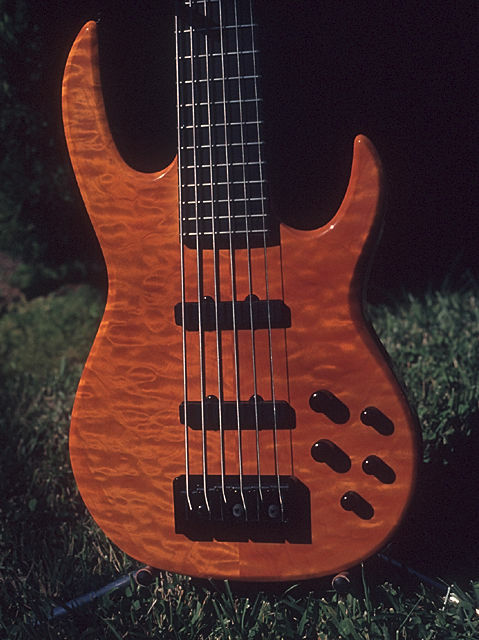 To all appearances this bass was a 2002 model, but it could have been made earlier. The quilted maple top sits on Carvin's standard one-piece maple through neck and alder body wings. The 24-fret ebony fingerboard has no inlays other than marker dots on the left (up) edge of the board, where only the player can see them. Understated black chrome hardware complements the gorgeous woods very nicely. Isn't she a beauty? I call her my "Beauty Queen" for obvious reasons. In August 2004, I had to part with her to make room for a non-Carvin acquisition. But I'll always fondly remember my Beauty Queen. Carvin's standard J99 single-coil pickups are adequate, well, barely adequate in this bass. The bridge pickup is reverse wound, reverse magnetic polarity to cancel hum when both pickups are in use. 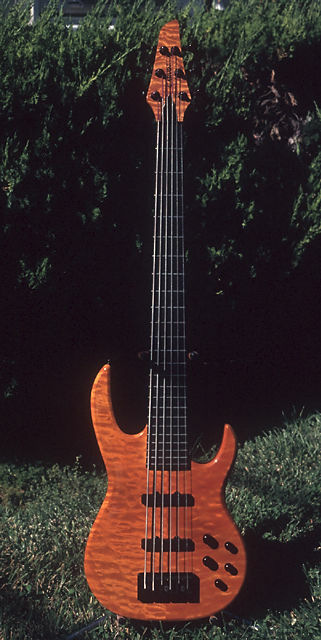 In September 2002 I installed a pair of Bill Lawrence J-45s in this bass. (Sorry, no photos of the new pickups yet.) I'm happy to report they transformed this bass into a tone monster! The J-45s have a wide-range, hi-fi response that complements this bass's naturally bright acoustic tone. They aren't completely silent; I notice a bit of a high-pitched buzz in my music room at home, which changes with position, suggesting they're slightly sensitive to electrostatic fields. But there's no 60 cycle (magnetic) hum that I can detect. 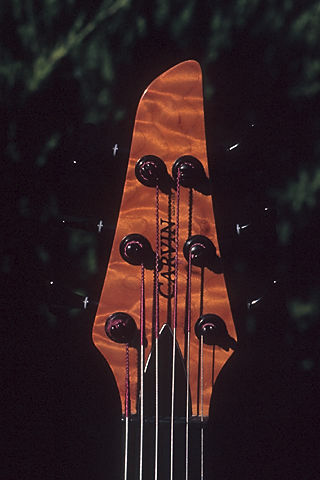 The electronics are Carvin's current standard 9V active/passive type; see the koa/maple LB75 page for details. Like all Carvins, the neck is relatively thin front-to-back. The wide neck gives it a slight tendency to "neck dive", but otherwise it balances well and is not excessively heavy for a 6-stringer. Replacing the Carvin/Gotoh tuning machines with a set of Hipshot Ultra Lites improved the balance a bit. I was pleasantly surprised to find the neck very playable, even with my average-to-slightly-large hands. The low B is very solid. I have found only minor dead spots on the neck, certainly no worse than most other basses. The tone, as purchased with Carvin's private-label stainless steel strings (made by La Bella), is bright but not excessively so. There was a slight lack of bottom end with the J99s, but it's not objectionable. And now that it has the Bill Lawrence pickups, any complaints I used to have about the tone are history! Here are some more details of this fine instrument. The gorgeous figure in the bookmatched top speaks for itself. Likewise, the headstock overlay shows superb figure. Here you can see the alder body wings and the one-piece maple through-neck. Quilted maple top LB76 / http://www.chucko.com/Carvin/LB76.html / Copyright © 2002 Chuck Fry / All rights reserved.